I began work on the follow-up to Naebody’s Hero a few weeks ago. Having now completed the planning and research phase of the new book, Somebody’s Hero, I’m moving into the writing phase. This normally lasts around 90 days for me. 90 days of writing when everyone’s asleep, during spare moments on the train, in coffee shops, during my lunch break or in the early hours. I’ve learned to be very productive in very little time (1000 words a day is my target. I never fall below this and frequently exceed it) and to write by instinct. There’s always time to rewrite later. I’m not the sort of writer who plans out every chapter. I have a beginning, middle and end (sort of) in mind and I take the book a chapter at a time and see where the characters go. This is the only way that I can write and helps put an unpredictability into the story as I don’t know what’s going to happen until it does. Plenty of writers have much more detailed plans for writing their novels, using percentages and mechanisms etc, but this is the most natural way for me to write. Here’s to 90 days of torment and fun. Frank McCallum Jr – Born in 1952, joined the Marines at 18 and MI5 at 21. Currently on loan to SvetlaTorrossian-Vasquez, at the American National Security Unit (NSU). In SH Frank Jr is 49 years old. Arif Ali – Former al-Qaeda recruit, current British Intelligence asset. Born in 1983; In SH Arif is 18 years old. Svetla Torrossian-Vasquez – Head of NSU, an American Intelligence agency which oversees all others. In SH, Svetla is 49 years old. Robert Hamilton – Hero. Born in 1973. In SH Rob is 28. Frank McCallum Sr – Retired Marine and British Intelligence legend. Born in 1930, joined Marines at 17 in 1947, joined MI5 at 20. In SH Frank is 71. Mike O’Donnell – Born 1962, Joined the CIA at 25, joined Homeland Security at 30. In SH Mike is 39 years old. Kim Baker – Retired head of CTA. Born 1944; In SH Kim is 57 years old. Jack Foley – Head of CTA, Kim’s Successor in the position. In SH, Foley is 50 years old. 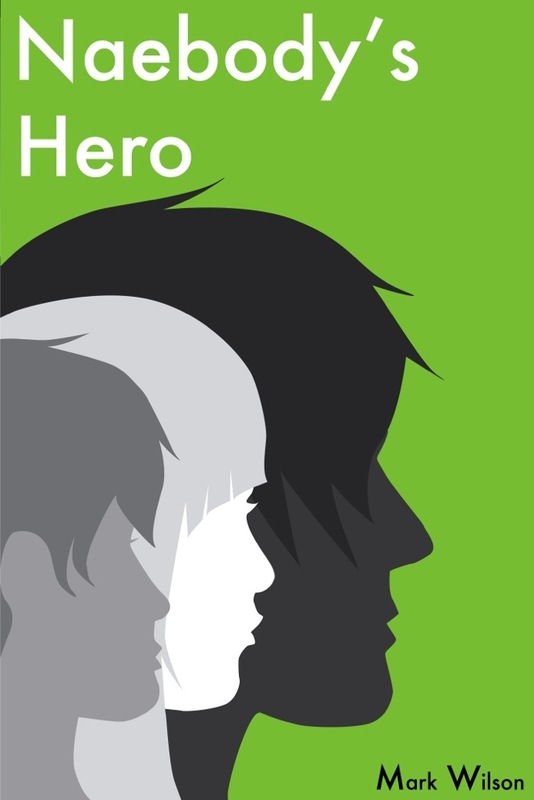 Naebody’s Hero is on special offer at 77p in the UK and 99c in the US until the end of April 2013. I read a book a few years back called “California Schemin'” by a Scottish guy called Gavin Bain. It was a hugely entertaining story of a young rapper and his mate who conned the music industry, gaining a record deal and big advance in the process. It was also a true story (See the upcoming BBC documentary “The Great Hip-Hop Hoax”). Gavin’s new band “Hopeless Heroic” were mentioned fleetingly at the end of the book so I decided to give them a wee try. They were and are awesome. I posted a comment on the FB page saying so and Gavin replied. We realised we had many interests in common and have been friends since. However the first time I met the guy, I started telling him all my past and secrets for seemingly no reason. Bless him, Gav sat there with a knowing smile on his bearded wee face, nodding along and offering his own insights. I was far from the first person to do this I suspect. Since I wrote Paddy’s Daddy, my autobiography, each new person I’ve met or old friend I’ve re-encountered after a few years has done exactly the same thing with me. I’ve been given others’ history, problems, worries, background and confidence. People have shared their own experience with depression either first-hand or of a partner. Sometimes I get stories shared with me that haven’t been told to anyone more close to the individual in the person’s life . I do the same thing Gav did with me. I sit and nod. I feel for them, and am very grateful that they’ve felt that they can trust me with their innermost thoughts. I think we do this with people who’ve biographies we’ve read, subconsciously to even the score. I think we feel that we have the other person at a disadvantage because we know so much about their feelings, life and emotions and we want to give them something of ourselves in return. I also think that there’s something easy about confiding in someone who’s been so open in their own life. I hate my book Paddy’s Daddy. I tell everyone that, though I do love my fiction novels (you will too. go buy them). It was a difficult story to write and I’ll write some more some day, but for now I never look at it. I don’t understand why it seems to help people to read it, but I’m very grateful for every reader and friend who share their stories with me in response. Subconsciously or not.